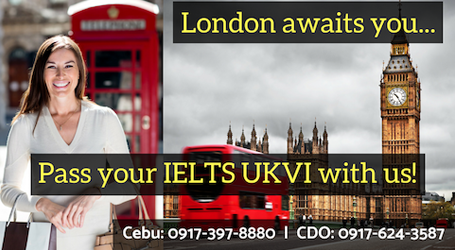 IELTS ( International English Language Testing System ) is a requirement in studying or working in USA, UK, Ireland, Canada, New Zealand and Australia. 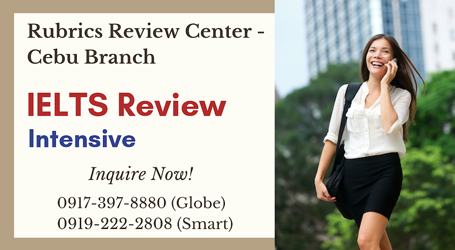 Rubrics is the leading IELTS specialist in the Philippines that offers best-in-class review programs with consistent high pass ratio results. It provides a non-threatening learning environment where everyone interacts freely and enjoy the fun of improving communication skills with great ease and confidence. Rubrics aims to create a cohesive bond among students making it easier to boost individual self-esteem and eventually bring out the best in them. 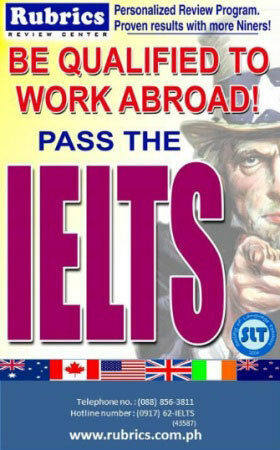 After all, Rubrics is not just an IELTS review center...it's your way to success!